On the cover. On the cover: If Nebuchadnezzar had adorned his hanging gardens with succulents, think how much he would have saved on the royal water bill—not to mention the ease and freedom drought-tolerant plants would have given his staff. Today we can take advantage of a wonderful array of succulent aerialists. These pages are dedicated to them and to the people who study and grow cliff-dwellers, epiphytes and non-obligate crawlers. When nicely suspended, vegetable curtains can make a spectacular show. 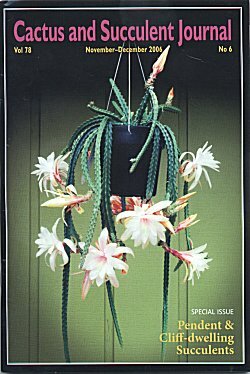 Imagine our cover, Aporophyllum 'Moolight' (photo by Lois Burks of Benton, Arkansas), multiplied by twenty! We have asked explorers of Mexico, Brazil and South Africa—and some of the best growers in the US and abroad—to show us the whys and hows of succulents on high. And we've barely scratched the surface. Consider this an invitation to explore some new ways to understand, grow and enjoy your plants.